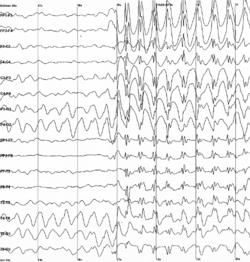 Is galar ainsealach néareolaíoch é an titimeas (seantéarma eile i nGaeilge: an tinneas beannaithe, i mBéarla epilepsy as Sean-Ghréagis ἐπίληψις "an t-ionsaí"). Tarlaíonn an galar de bharr an iomarca díluchtaithe leictreachais sioncroineacha taomghoineacha ó chealla na hinchinne. Má tharlaíonn an díluchtú tobann seo d’fhéadfadh go dtarlódh cailliúint comhfheasa, athruithe san iompraíocht nó gluaiseachtaí ainneonacha (.i. taom titimis). Féadfaidh taom a bheith ag duine ar bith, ach leis an titimeas tá an claonadh ann taomanna aisfhillteacha a bheith i gceist. Is coitianta an galar é an titimeas. Ceaptar go gcuireann an titimeas isteach ar duine amháin ar a laghad as 200. Tá dhá priomhchineál titimis ann: an titimeas ginearálaithe agus an titimeas fócasach. Roinntear an dá chineál i bhfóchineálacha éagsúla de réir cúis (cúis ar eolais nó cúis anaithnid), cumraíocht na dtaomanna (taomanna tónacha clónacha, taomanna mioclónacha, taomanna neamhláithreachta, is araile), aois na ndaoine (roinnt cineálacha speisialta san óige) agus suíomh san inchinn (i maotháin na hinchinne). Is é an ceistiú ar an othar (an anaimnéis) an modh diagnóise is tabhachtaí. Modhanna eile an leictreinceifealagrafaíocht (EEG) agus modhanna raideolaíochta, go háirithe an íomháú athshondais mhaighnéadaigh (MRI). Is é sprioc na teiripe ná taomanna a chosc. Tugtar cógais mar shampla Carbamazepine, aigéad Valpróach (Valproic acid), Phenytoine, Lamotrigine, Levetiracetam, Gabapentin, agus araile. Is féidir obráid titimeach a dhéanamh ag cineálacha fócasacha éagsúla titimis. Alastar Mór, Iúil Caesar, Napoleon, Gustave Flaubert, Fyodor Dostoyevsky, Agatha Christie, Molière, Leonardo da Vinci, Michelangelo, Vincent van Gogh, Georg Friedrich Händel, Paganini, Alfred Nobel, Pápa Pius IX, agus araile. Tabhair aird ar an séanadh leighis le do thoil! Tugadh an leathanach seo cothrom le dáta an 27 Iúil 2017 ag 13:53.